Russian journalist Arkady Babchenko, listens for a question during a news conference with Vasily Gritsak, head of the Ukrainian Security Service and Ukrainian Prosecutor General Yuriy Lutsenko at the Ukrainian Security Service on Wednesday, May 30, 2018. Babchenko turned up at a news conference in the Ukrainian capital Wednesday less than 24 hours after police reported he had been shot and killed at his Kiev apartment building. 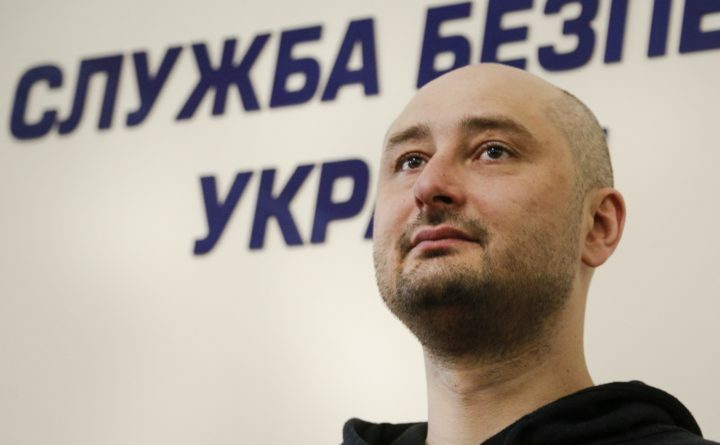 MOSCOW — A fierce Kremlin critic and prominent Russian war correspondent, Arkady Babchenko, showed up alive at a news conference Wednesday in Kiev, one day after he was reportedly shot and killed in the same city. Ukraine’s chief of security services, Vasyl Gritsak, said Babchenko had faked his own death as a ruse to foil a real plot against his life. Babchenko, 41, fled his native Russia for Ukraine last year after receiving death threats for criticizing Russian military involvement in Syria. He told reporters Wednesday that his fake death was part of an operation with the security services in Ukraine that took two months to prepare. Russia had demanded on Tuesday that Ukraine conduct a full investigation into his death, though many suspected that Moscow was behind the attack. Babchenko first offered “special apologies” to his wife, who had reportedly found his body after being shot several times by the entrance to his apartment in Kiev. It was not immediately clear if she had been involved in the plot or not. The journalist, according to the version made public on Tuesday, was found by his wife bleeding at the entrance to his block of flats, shot several times in the back, and died in an ambulance. It was not immediately clear how exactly the murder was staged. His alleged death was widely condemned by American and European officials as an attack on press freedom. Russia’s foreign ministry expressed relief at Babchenko being alive. “If only it were always like this. It’s a pity masquerading didn’t happen in other situations,” ministry spokeswoman Maria Zakharova wrote on her Facebook page.